AWS launched a new service for AR and VR industry called Amazon Sumerian. 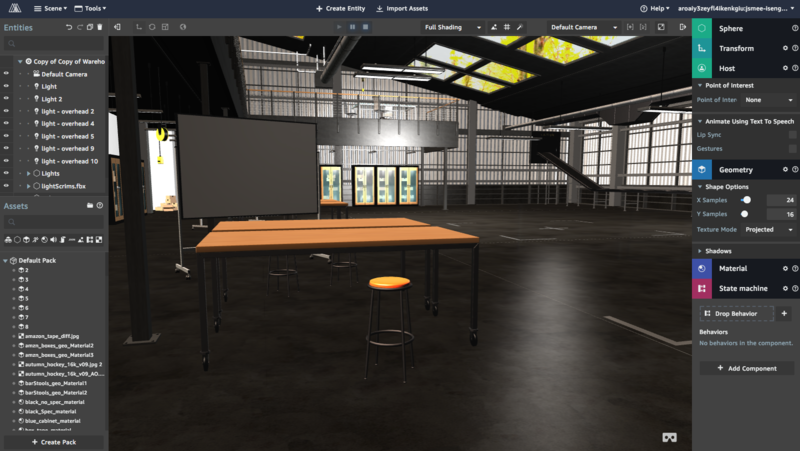 Amazon Sumerian lets you create and run virtual reality (VR), augmented reality (AR), and 3D applications quickly and easily without requiring any specialized programming or 3D graphics expertise. With Sumerian, you can build highly immersive and interactive scenes that run on popular hardware such as Oculus Rift, HTC Vive, and iOS mobile devices (support for Android ARCore coming soon). Scene Editor: Sumerian provides web based editor where you can create any kind of scene using 3D assets, add characters, write logic for objects using text editor and to control their behavior and create an interactive story line. Hosts: Sumerian hosts( 3d animated ) are virtual characters which you can put in your scene. Hosts can guide your users by narrating scripts or answering questions. You can use AWS Polly and Lex to make hosts interactive. Publish: By publishing scene you will get a unique URL which can be used to access your content on any supported device. Right now Sumerian is in preview mode and you can register here to get early access.